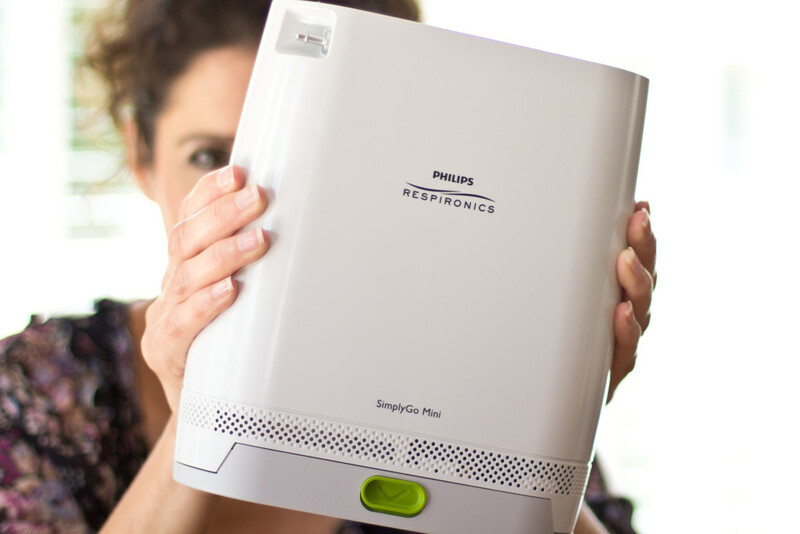 Today Philips Respironics is releasing their newest portable oxygen concentrator – the SimplyGo Mini. Boasting 5 pounds with pulse flow up to setting 5, the SimplyGo Mini has upped the ante in the market and is the new standard for high oxygen capacity in a small compact size. 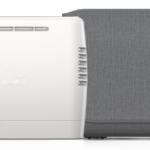 Philips’ last portable concentrator offering was the SimplyGo, a 10-pound unit that provided pulse flow settings up to 6 and continuous flow up to 2 liters per minute. While the SimplyGo continues to be the lightest continuous flow unit available among all brands, oxygen users are increasingly seeking portable concentrators that are small and light enough to allow an active lifestyle. 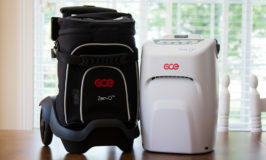 It wasn’t long after the release of the SimplyGo in the spring of 2012 that Philips began working on its newest offering, the SimplyGo Mini, which is now the most powerful oxygen concentrator among 5-pound units, boasting 20% more oxygen capacity than competitors’ models. The SimplyGo Mini offers simple touch screen operation and has two battery options. The standard battery keeps the overall weight at 5 pounds and provides 4.5 hours of operating time at setting 2, while the extended battery increases the weight by just 1 pound and provides an impressive 9 hours on setting 2. The unit comes standard with your choice of battery size, AC power for electrical outlets, DC power for automobiles, a brown carry bag that has a built-in carry handle and a removable shoulder strap that allows you to carry the unit over your shoulder or cross-body. A matching accessory case rounds out the complete system. Optional items include an external battery charger and a custom backpack. Also available is the carry bag, accessory bag and backpack in black. Online retailers have the new SimplyGo Mini in stock, with pricing starting at $2,595. Be sure to look for the SimplyGo Mini badge on the retailer’s website to ensure that you are purchasing your unit from an authorized dealer. Also, be sure to review my article on why choosing the right dealer is so important. I’ll be returning later this week with a full review of the SimplyGo Mini. In the meantime, I would love to hear from those of you who get your hands on the new SimplyGo Mini right away. Is it the unit you’ve been waiting for? I have an Inogen One G3 – are the batteries, backpack, etc. interchangeable with this Respironics Simply Go Mini? The Inogen One G3 and the Respironics SimplyGo Mini are made by different manufacturers and the parts are not interchangeable. I’m looking for a portable concentrator that is light weight and includes pulse and continue. You had comment s on the Phillips mini. Can you please contact me so I can use your help to determine the best unit. What oxygen flow setting do you need? If you need only up to 2 LPM, then the Respironics SimplyGo is the smallest unit that offers 2 LPM continuous and pulse flow settings up to 6. If you need more oxygen (up to 3 LPM continuous) then the SeQual Eclipse 5 would be a good choice. I only provide information about oxygen concentrators. I do not sell them. No, the SimplyGo Mini is a pulse only unit that provides up to setting 5. For continuous flow up to 2 LPM and pulse settings up to 6, you would need the original SimplyGo. Dear Allison, we are looking for a new oxygen concentrator for my nephew, who needs 4LPM in the pulse flow. How would you compare the Simply Go Mini and the Inogen G3. Thanks a lot! I don’t think you’d go wrong with either unit. They are very similar in size and weight, provide the same levels of oxygen and are both made by reputable companies. At this point, I cannot find any feature that would make more advantageous that the other. Hey, I am in a very similar situation. I am currently using O2 tanks with a PD1000 pulse dose. However, when I walk, I breathe too quickly for it to keep up and half my breaths aren’t given oxygen. Do you think that going with one of those 2 O2 concentrators would help and if so, whether one of the 2 would be a better choice considering my issue? Small POCs such as the SimplyGo Mini and Inogen One G3, work on a minute volume delivery. This means that the unit delivers a consistent amount of oxygen over the course of a minute. The faster you breathe, the less oxygen you receive per breath; the slower you breathe, the more oxygen per breath. Since your fast breathing is a response to needing more oxygen, a small POC will not be any better than your PD1000 conserver. You need a higher flow setting, or a POC that delivers consistent oxygen per breath even when you breathe faster. For this, I would recommend the SeQual eQuinox or SeQual Eclipse 5. While larger than you may prefer, these units can handle faster breathing rates easily. I have not heard information about the European market for the Mini and, unfortunately, I am unable to find anything on Philips’ website. I am sorry I am unable to help you. I am looking for a backpackable battery powered oxygen concentrator that would allow me to continue skiing. I don’t use oxygen in my daily life and while I use a CPAP machine at night I do not require oxygen with it.my lung capacity will not allow me to ski any longer as I run out of breath too soon and have to stop and catch my breath too often for skiing to be meaningful. I miss it and I’ve seen people walking around with O2 concentrators and it occurrs to me that I might be able to carry one and ski again. Any suggestions? The SimplyGo Mini on this page, as well as the Inogen One G3 and GCE Zen-O lite are all a good size and weight to be easily carried in a backpack. Each of these units provides pulse flow up to setting 5. The amount of oxygen your doctor prescribes would determine whether these would be suitable for you.